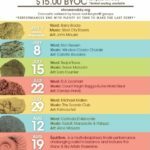 The 6th annual Stone & Sky Music & Arts Series is a growing and eclectic series of concerts and other artistic events containing spoken word, live performance, and visual arts. 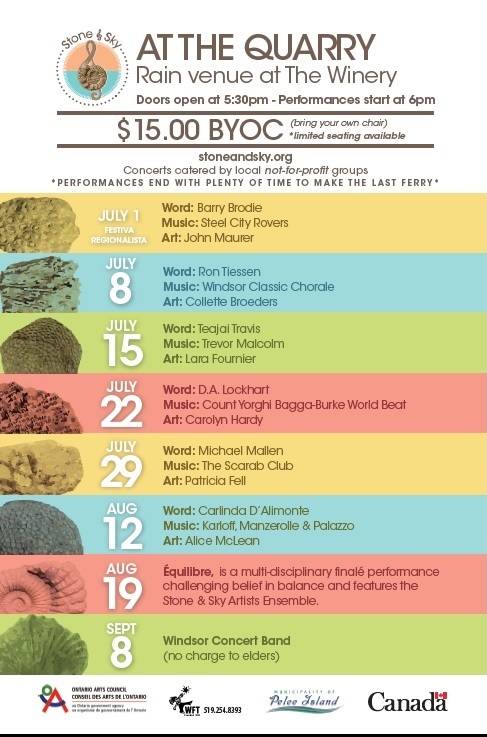 It takes place over 8 weekends in July, August and September in a disused, fossilized, limestone quarry and rehabilitated former landfill on Pelee Island. This gem of a venue boasts remarkable acoustics and flourishes with indigenous and endangered species of plants and animals, some of which are native only to Pelee Island in all of Canada. Primarily promoting local professional artists, we are proud to present Steel City Rovers, Windsor Classic Chorale, Trevor Malcolm, Count Yorghi Bagga-Burke World Beat, The Scarab Club, Karloff, Manzerolle & Palazzo, and the Windsor Concert Band as our musical performers this year. All artists (approximately 65) participate in week long residencies that culminate with the delivery of weekend workshops at no cost. Our finalé, multi-disciplinary performance is called Équilibre, which challenges belief in balance and features the Stone & Sky Artists Ensemble. Stone & Sky is recognized by Heritage Canada and The Ontario Arts Council. Doors open at 5:30, performances end in time to catch the last ferry to the mainland! Open Quarry | Saturdays from 10 am – 1 pm to catch a glimpse behind the curtain of artists and their practices. Artists will be plying their trade in the shade while the public is encouraged to ask their advice, participate in a workshop, or simply sit and watch. The Quarry is located on East West Road on Pelee Island. From the ferry terminal, turn right and walk along W Shore Road, then turn left onto East West Road. The Quarry will be ahead on your left. It will take about 10-15 minutes to walk from the ferry terminal.